Welcome, welcome to a new year at Hogwarts!, sorry, Writivism! Before we begin our banquet, I would like to say a few words. And here they are: Nitwit! Blubber! Oddment! Tweak! Just so you know I wrote that Harry Potter quote with a grin on my face. And for those in the green, from their humble beginnings in 2013, the Writivism Short Story Prize is in its fourth year and has grown by leaps and bounds to become such a driving force in Africa’s literary calendar. Being a continent that is consistently misrepresented at the world stage, African initiatives such as Writivism give Africans a platform to exhibit their creative potential. And there’s no better way than through celebrating creativity through writing. Of the shortlisted writers, I want to start with Acan Innocent Immaculate from Uganda and review her dystopian fantasy, SunDown. What interested me about Acan’s story is the genre, which although quite popular at the moment internationally isn’t quite so in Africa. Well, we did love Harry Potter, so it goes to reason, an audience awaits spell-binding fantasy and dystopia. SunDown is set in the year 2050 and centered around a 15 year old albino boy awaiting the cataclysmic death of the sun. The character named Red Sun is left behind along with other rejects during the Mass Exodus of healthy, able-bodied human beings onto space ships in search of a new home. The plot tangent is quite interesting, despite a rather slow buildup to the climax. Reimagining a world ending in Nakasongola, a remote region in Uganda right now instead of the tired setting in American cities, gives dystopia a fresh coat of paint. Red Sun, an albino torn between his loathing for the sun which burns his skin and a bleak short existence without it makes for good literary fodder. And what was that about the dwarf…was it a magical creature? What did mankind do that was so terrible that the sun was losing its potency? What was it that Red Sun was reading and could he be the key to staving off the impending end of the world? Like I said, the plot shows a lot of promise. I loved the climax and the cliff-hanger ending is just awesome. I would have loved Acan give the story more direction, especially at the beginning. A short story leaves little room to be verbose that one is forced to get to the point from the get-go. I would have made the plot stronger and more snappy to reflect an end-of-the-world scenario. The tempo changes abruptly from chill to catastrophic in the blink of an eye. A stronger build-up and better diction would have improved the story greatly in my opinion. Not that I didn’t enjoy it, mark you. The ending just blew me away! 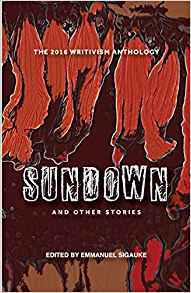 SunDown is shortlisted for the 2016 short Story Prize. This review was originally published at She Made Me Do It, as part of the #Writivism2016 Festival Book Features. Sydney Mugerwa is one of the select official book bloggers. He will review a number of Writivism stories alongside books that will be launched, featured and available for sale at the festival. Look out for the badge below on your favourite book blogs. And come to the festival to buy the books and get them signed.